Candidates are spending millions to win hotly contested elections as key battlegrounds are being drawn. Dozens of governor's races are in play, as is control of the United States Senate. Now, according to a bipartisan battleground state survey commissioned by RespectAbility of 1000 likely 2014 voters, swing voters in Senate and Governors races are more likely to vote for a candidate who makes a high priority of "enabling citizens with disabilities to get jobs and become independent." 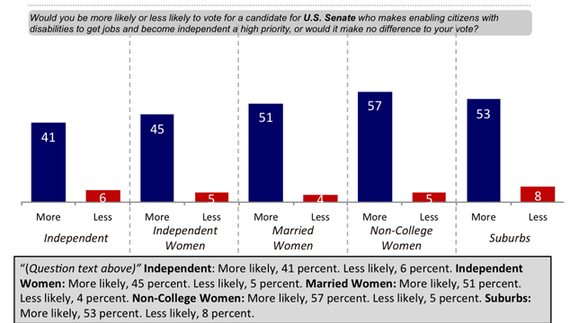 Overall, voters are similarly more likely to support candidates for U.S. Senate making this a priority at 49 percent versus 5 percent, while for Governors it is 53 percent versus 3 percent. Key swing voter groups in these battleground states are also more likely to vote for senate candidates who support these policies. Fully 56 percent of voters report having a family member or close friend with a disability, 43 percent do not. While conventional wisdom has long been that disability issues are the purview of the Democratic Party, the poll shows otherwise. Amongst likely voters with disabilities, 31 percent are Democrats, 31 percent are Independents and 36 percent are Republicans. Amongst their family members it is 35 percent Democrats, 33 percent Independents, 30 percent Republicans. For their close friends it is 36 percent Democrats, 38 percent Independents, and 24 percent Republicans. Thus this represents the ultimate swing voter group. Said Stan Greenberg, PhD, "Issues of employment among people with disabilities can affect outcomes in competitive races for Senate and Governor. This community is far bigger than many people realize, including people in my profession." Likewise, Republican Whit Ayres commented, "We are accustomed to thinking about "soccer moms", "Hispanics" or "values voters." But this poll shows that Americans with disabilities - and those who care deeply about them are a demographic we need to pay attention to in the future." Today, 70 percent of people with disabilities (PwDs) are not employed, even though polls show that most of them would prefer to work. Our nation was founded on the principle that anyone who works hard should be able to get ahead in life. This poll demonstrates that Americans on both sides of the aisle will vote for candidates who share their belief that people with disabilities deserve to beable to work to achieve the American dream, just like anyone else. The U.S. recently passed the new Workforce Innovation and Opportunities Act (WIOA). However, WIOA has not yet been implemented. The next governor of every state will have the opportunity to dramatically shape these policies, and voters are demanding results. While voters are saying they want candidates who are committed to jobs and opportunities for citizens with disabilities, they don't feel they are getting it today. A majority of Americans (54 percent) think that the state government is "not doing enough/not doing anywhere near enough" to "help people with disabilities get jobs and become independent" while 28 percent think the state is "doing more than enough/enough." While a majority respond the government is "not doing enough/not doing anywhere near enough", over 30 percent more Democrats (73 percent) believe the government is not doing enough versus 40 percent of Republicans feel the same. The partisan split is more pronounced on the role of the federal government. Overall, likely voters respond similarly to the question of whether the federal government is doing enough to "help people with disabilities get jobs and become independent." More than half, 52 percent believe the federal government is "not doing enough/not doing anywhere near enough"(Dem 67, Rep 38), 35 percent believe it is "doing more than enough/enough" (Dem 19, Rep 49). One of the biggest barriers for work is an outdated benefits system which was written for another time when it was assumed that people with disabilities would be dependent their whole lives. The Federal government literally called these programs "Aid to the Permanently and Totally Disabled." These days new technology, medical breakthroughs, and a recognition that people with disabilities want to work have destroyed this antiquated thinking. There is strong bi-partisan support, nearly 8 out of 10 voters, for increasing the current caps on monthly income ($1,070) and assets ($2,000) of people with disabilities in order to allow them to earn more without risking their benefits. Fully 88 percent of Democrats support this increase, 9 percent oppose and 68 percent of Republicans support, 26 percent oppose. Beyond personal support for changing this policy, 71 percent of Democrats and 40 percent of Republicans are more likely to vote for a candidate for U.S. Senate who supports this change. Only 5 percent of Democrats and 13 percent of Republicans are less likely to vote for senate candidates based on this issue. Fully 88 percent feel that as a customer it is important "that the companies you do business with do not discriminate against qualified people with disabilities." Over 60 percent feel that this is "very important." And, despite the low levels of employment of people with disabilities, a nearly unanimous electorate (98 percent) is open and supportive to hiring more people with disabilities responding that if they were an employer, manager or small business owner, they would be "willing to hire a qualified person with a disability." Businesses should recognize that there are over 56 million Americans with disabilities. They are not only voters, they are consumers. Nearly two-thirds of voters (65 percent) surveyed favor the Convention on the Rights of Persons with Disabilities, also known as the Disability Treaty. The Disability Treaty is an international human rights treaty of the United Nations modeled after the Americans with Disabilities Act. This Treaty encourages the adoption of laws around the world that promote accessibility, equal opportunities and end abuse and discrimination of people with disabilities. Only 23 percent oppose the treaty. The majority of likely American voters are experiencing disability, either because they have a disability or have a loved one who does. It impacts voting, and elected officials need to pay attention. Voters with disabilities want jobs and the people who love them want them to have the opportunity to succeed. Now is the time for candidates to bring forward their plans so that all Americans, regardless of their abilities, have the opportunity to work and succeed.